The moment Mike Colter beheld Denzel Washington in A Soldier’s Story at the age of 8, he got hooked for life and that birthed his passion and desire to pursue a career in acting. He was an active member of the drama club while in high school, honing and exploring his acting skills. The actor has remained active and successful since the inception of his professional acting career. His debut was in Hindsight, an episode in television series ER where he starred as Watts. However, the dark and handsome American actor is easily remembered for playing Lemond Bishop in the television series The Good Wife, Malcolm Ward in Ringer, and even more renowned with his titular role in Netflix and Marvel’s web and TV series – Luke Cage, The Defenders, and Jessica Jones. Get all the juicy details about Mike Colter including his wife, height, weight, body measurements, age, net worth and more below. The actor who is of African American ethnicity with an American nationality was born on August 26, 1976. He is the youngest of the five children born to his parents – Eddie Lee Sr. (father) and Freddie Marion Colter (mother). While his place of birth was Columbia, South Carolina, he grew up with his siblings in St. Matthews, South Carolina. Mike Colter graduated from Calhoun County High School where he was named ‘most ambitious’ in his senior year. After spending a year at Benedict College, Colter moved on and got his BA in theatre in 1999 from the University of South Carolina where he had transferred to. He furthered his education at Rutgers University Mason Gross School of the Arts where he secured an MFA degree in acting. Equipped with his academic qualifications and a burning passion for the arts, Colter took the movie industry by storm. Thanks to Denzel Washington’s stellar performance in A Soldier’s Story, Colter knew right from childhood the career path he wants to follow. He finally got his chance and launched his acting career in the television series ER, portraying the character of Watts. His debut role led to many others and after playing short roles on television series, he moved his career to the next level, starring in high-profile films like Million Dollar Baby as a boxer named Big Willie Little. In addition to grabbing a role in many TV movies and in the series – Ringer, Colter guest starred on Law & Order: Trial By Jury, Law and Order: Criminal Intent, The Good Wife, The Parkers and more. He later joined the Halo franchise in 2014 with his role as Agent Jameson Locke. The talented actor is related to popular actress Viola Davis as a second cousin. 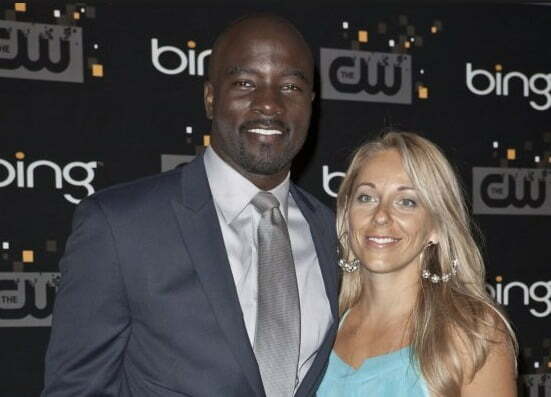 Mike Colter has been married to Iva Colter since 2016 and on September 27, the same year they got married, during a segment on the Wendy Williams Show, the actor revealed that he has a daughter with his wife. When a picture of the actor and his wife appeared on the screen during the talk show, the audience suddenly stopped cheering in apparent disapproval. Notably, Iva is white while Colter is a black man. Choosing to marry a white woman sparked controversies and gave Colter his fair share of criticism. Apparently, interracial marriage still doesn’t sit well with a lot of people. Notwithstanding, Colter is ready to defend his marriage from all critics. Coupled with his black hair which he usually shaves off and a pair of captivating dark brown eyes, Mike Colter stands tall at 6 feet and 3 inches with a body weight of 90 kg to go with it. His muscles and abs are also on point with a chest size of 45 inches, a waist size of 36 inches and his biceps pegged at 15.5 inches. Mike Colter’s shoe size is 9.5 US. What’s Mike Colter’s Net Worth? With the kind of popularity he commands in the very lucrative movie industry, it’s expected that the actor must have made a fortune for himself. And he did. While his salary is not known, there’s no doubt he’s taking fat cheques home with an attractive net worth which is estimated to be around $2 million. The actor’s net worth is bound to add more figures since he is still very much active in his acting career and other endeavors. Besides, he still has his years ahead of him.